As most of us do, when we have a break from school, we spend it planning and gathering materials and resources for the next several weeks to try to "get ahead" (not sure if I'll ever do that)! But as I take a peek into what I have planned for February, I thought I'd share a few fabulous finds from fellow bloggers and a couple of my latest units for February. 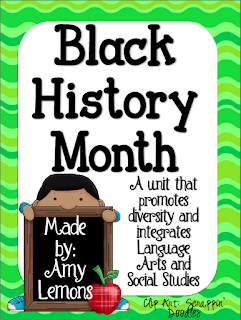 To begin our study of Black History Month, I will start with this adorable unit from Amy Lemons! It's fun, interactive, and engaging for the kiddos. I love the integration of ELA and Social Studies! Towards the middle of the month, we will start talking about President's Day. I plan to use a cute little unit from A Cupcake from the Teacher. 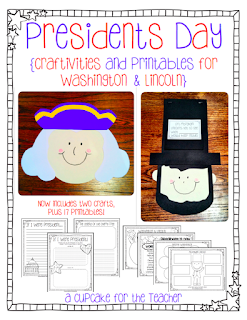 I love the graphic organizers included in this unit when learning about the presidents! Just for a little Valentine's Day fun, I plan to throw in this little activity from Babbling Abby! I can't wait to have fun with my kiddos using this pack! 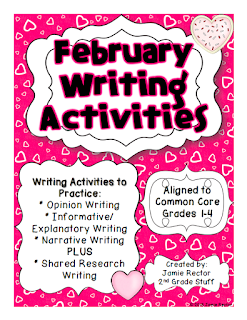 Finally, in writing, we'll be using my Common Core Writing Activities for February. The students will enjoy practicing the 3 different genres of Common Core Writing PLUS Shared Research Writing in a fun, authentic way. While you're there, you can also check out my other monthly Common Core Writing Activities if you're not already a regular buyer :) The feedback on these writing units are great! 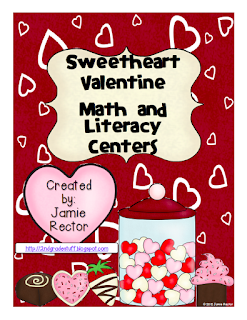 We will also be using my Sweetheart Valentine Math and Literacy Centers to reinforce key skills and concepts. The kiddos love these and don't even know they're learning! I'll be back to share some more fabulous finds from my bloggy friends for science! We will begin studying about weather patterns, the water cycle, and the states of matter in February! This month is full of fun, but I'll save the science post for next time. So excited to have found you! Linda Kamp mentioned you in a comment on my blog today. I loooove Linda, so if she loves you, then I had to stop by! Soooo glad I did!